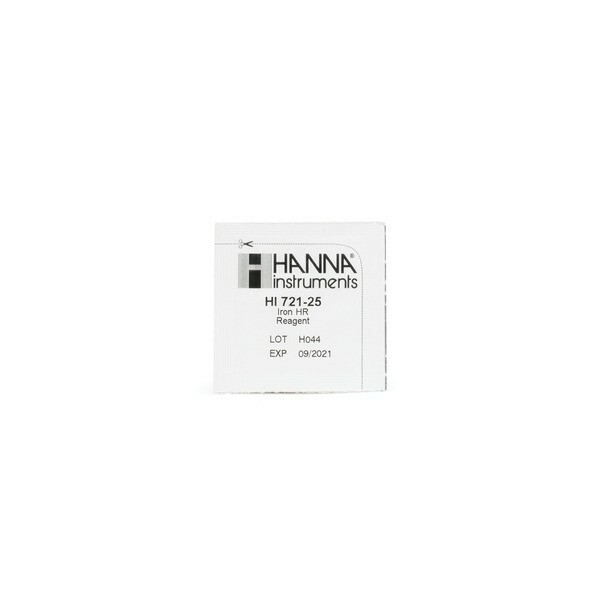 Product information "HI721-25 Reagents for HI 721 Checker HC ®, 25 Tests"
The HI721-25 are the replacement reagents for the HI721 Iron Checker® HC. These high-quality reagents are manufactured in our state-of-the-art facility and are clearly marked with the lot number and expiration date on each packet for traceability. The HI721-25 are high-quality reagents that are pre-measured, allowing for users to achieve fast and accurate measurements with their Iron Checker® HC. These reagents follow the Phenanthroline Method in which the reaction between iron and reagent causes an orange tint in the sample. By simply adding the packet of HI721-25 reagent to the sample, the reaction will take place and the HI721 will determine the concentration from the color that is produced. The results will be displayed in ppm (mg/L) of iron. These reagents are designed to be used with samples that have an expected range of 0.00 to 5.00 ppm (mg/L) iron. adaptation of the EPA Phenanthroline Method 315B, for natural and treated waters. The reaction between iron and reagent causes an orange tint in the sample. Related links to "HI721-25 Reagents for HI 721 Checker HC ®, 25 Tests"
Customer evaluation for "HI721-25 Reagents for HI 721 Checker HC ®, 25 Tests"